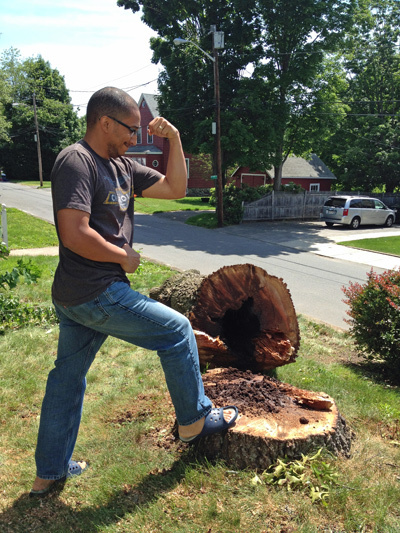 The Story: My oh so strong husband after pushing down the tree in our yard! So I did take this picture of Leao and the tree that was being removed from our property. It has been a long time coming and we caught it just in time before the carpenter ants destroyed it more. Please note the appropriate shoewear that he is wearing while creating this amazing feat. 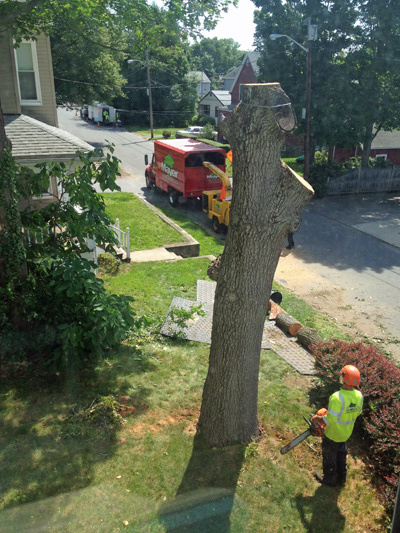 The Truth: It took several arborists and a truck to bring down this tree. I find that I am facinated at how much knowledge and skill is required to take down a tree without errors. If you look closely you will see the rubber ats they layed down on the grass. Well as they cut large limbs off of the top of this massive tree, they would push them down and they landed directly on the mat then would roll to the edge and fall to the street where the other arborists would put them in the truck to be cut up. When they brought down the final tree truck, they moved the truck to the precise angle before he laid into the tree with the chainsaw. It was amazing.